What is WD-40 and what does it do? WD-40 was created in 1953 by the Rocket Chemical Company in America. There are differing opinions of who actually invented the WD-40 formula. The company website credits Norman Larsen, yet some historians claim it was Iver Lawson who came up with the water-displacing mixture after working at home, and turned it over to the Rocket Chemical Company (later renamed to WD-40 Company). It was then Norman Larsen, president of the company, who had the idea of packaging it in aerosol cans and marketed it in this way. The name WD-40 is abbreviated from the term “Water Displacement, 40th formula”, suggesting it was the result of the 40th attempt to create the product. The spray, composed of various hydrocarbons, was originally designed to be used to protect the outer skin of a missile from rust and corrosion. WD-40 was later found to have many household uses and was made available to consumers in America. It was soon written up as a new consumer product and within a few years it was being used by many major American airlines. By the 1970’s WD-40 was being marketed to farmers and mechanics in England. What is WD-40 made of? OK, we’re going to get a bit technical here! The long-term active ingredient is a non-volatile viscous oil which remains on the surface to which it is applied, giving lubrication and protection from moisture. This oil is diluted with a volatile hydrocarbon to make a low viscosity fluid which can be aerosolised to penetrate crevices. The volatile hydrocarbon then evaporates, leaving behind the oil. A propellant creates pressure in the can to force the liquid through the can’s nozzle before evaporating. Its properties make it useful in both domestic and commercial settings. Typical uses for WD-40 include removing dirt and extricating jammed screws and bolts, although you may be surprised to know that there are many more uses for WD-40 than the original creators could ever have envisioned. What are these uses you speak of? Drives out moisture – Because WD-40 displaces moisture, it quickly dries out electrical systems to eliminate moisture-induced short circuits. Protects – WD-40 protects metal surfaces with corrosion-resistant ingredients to shield against moisture and other corrosive elements. Frees sticky mechanisms – WD-40 loosens rust-to-metal bonds and frees stuck, frozen or rusted metal parts. Removes – WD-40 gets under grease, grime, and gunk. WD-40 non-aerosol formulas also dissolve adhesives, allowing easy removal of labels, tape, stickers, and excess bonding material. 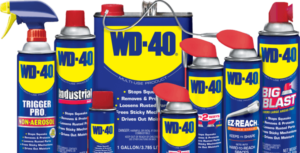 Lubricates – WD-40’s lubricating ingredients are widely dispersed and hold firmly to all moving parts. That’s all very good… but what else? Crayola Stain Removal Tips recommends using WD-40 to remove crayon marks from a variety of surfaces. A bus driver in Asia used WD-40 to remove a python which has coiled itself around the undercarriage of his bus. Like most successful products, WD-40 has grown and expanded to offer much more than just one product. Here at Opie Oils we can supply the full range, just browse or search our website to find the right product for you. Multi-Use Product – Popularly known as “the can with thousands of uses”, there is almost the same number of different variations available! The original product is available as a 100ml Handy Can and a 600ml Industrial Size Can. For those that find themselves losing the little red straw on an annoyingly regular basis, you may find the innovative “Smart Straw” range helpful. We supply 300ml Aerosol and 450ml Aerosol. If you prefer to avoid aerosols, you may be interested to know that you can also buy the original formula in a 5 litre tub, which comes with a spray dispenser included. If you want additional trigger spray bottles we can supply those too! Motorbike – A range of products specifically designed to give riders, mechanics and general enthusiasts best in class maintenance care for the motorbike all year round, helping improve performance. High-performance products that make it easy to keep a motorcycle in optimal condition, allowing riders to safely do what they love: Ride! Follow the link to the WD-40 Motorbike range to view the products we can provide to you today. OK you’ve convinced me, but why buy from Opie Oils?